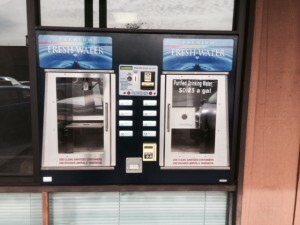 The Window Vend water vending machine is a window mounted water vending machine used to sell water afterhours or for those who wish to purchase water from outside the store. It is currently used in water stores and other retail water operations in North America. The Window Water Vending Machine, also known as the Window Vend, will accept US currency with the option to change for Mexican currency and Canadian currency for an additional cost. 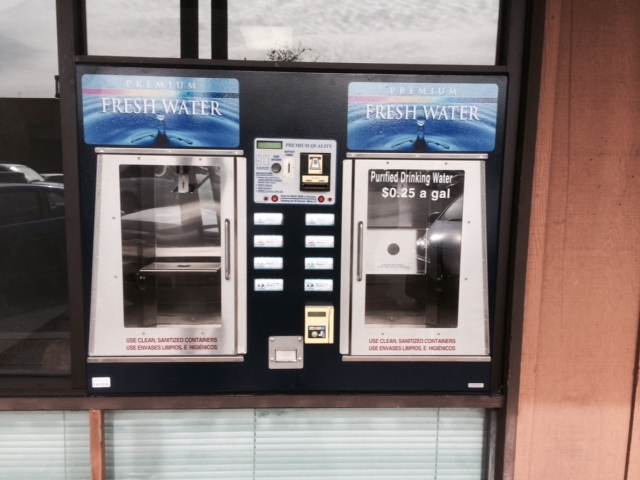 The Window Vend is a very easy to use, reliable unit making it a cost effective solution for customers to easily buy water and increase sales due to its 24-hour operation. It can fill various size bottles ranging from 1 to 5 gallons. The Window Vend comes pre-calibrated to fill 1, 2, 3, and 5 gallon bottles. The Window Vend is available in a single vend or a dual vend. The Window Vend water vending machine comes standard with a coin currency acceptor mechanism but has the option of having a dollar bill acceptor or credit/debit card acceptor for an additional cost. The Window Vend features 4 different filling selection buttons making it easy for customers to fill appropriately sized bottles or containers. It includes a solid-state control circuit board to increase reliability, unlike other machines, which have fail prone microprocessors. It includes a LED read-out for operational procedures to make its operation user friendly. 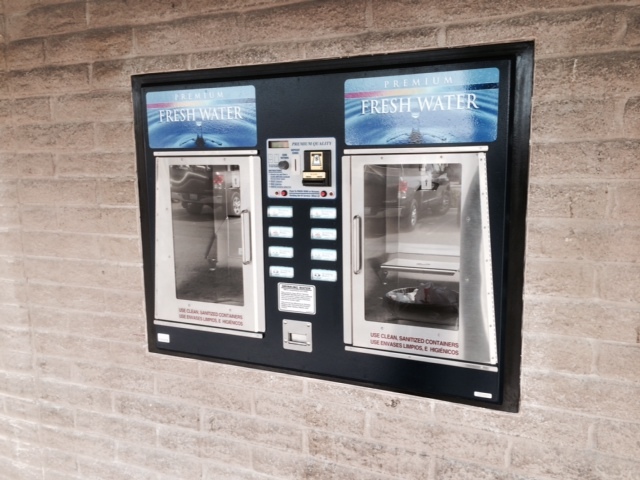 The Window Vend has metered vending allowing for accurate measurement of dispensed water. It also features a pause button allowing customers to pause the machine to switch bottles during the filling process. The dispenser housing is made of stainless steel to prevent rust. The Window Vend has an internal carbon filter to polish the taste of the water to ensure the water tastes clean and is odor free. It also includes an internal ultraviolet (UV) light to kill 99.9% of bacteria to ensure that the water being delivered by the machine is bacteria free. The UV includes an UV temperature flush, which flushes water through the unit to prevent any sort of possible contamination, which can be found in warmer climates. This is done by running small amounts of water through the unit when the water inside reaches temperatures that allow for bacteria growth. The Window Vend comes in an attractive blue finish with clear self-closing Plexiglass door that is very durable. The body of it is made of a painted steel frame making it secure and preventative of theft as well as rust proof. The blue finish consists of an epoxy primer with polyurethane enamel finish that is very durable to prevent blemishes. All maintenance and removal of currency is done through the lockable backside of the vending machine to further prevent theft of the money kept within the machine. The Window Vend is made in the USA with high quality NAMA approved parts. NAMA is the official certification organization for vending machines within the USA, making this unit approved for use anywhere in the US and most other countries. 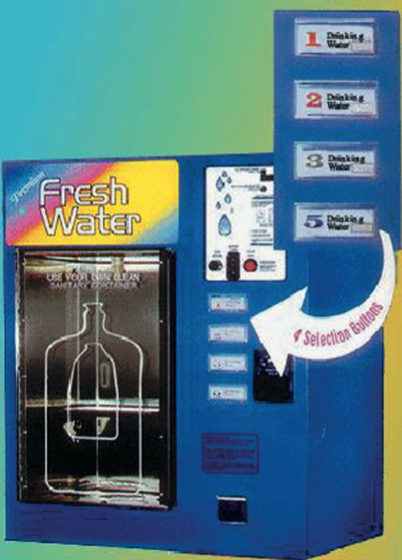 The water vending machines comes with prefabricated water inlet and drain connections allowing it to be easily installed. It comes with a 1-year warranty on defective parts as well as ongoing technical support. An instruction manual is included which outlines installation and operational procedures. Plumbing connec(ons: 1⁄2” FNPT x 2 feed; 1” FNPT x 2 drain.